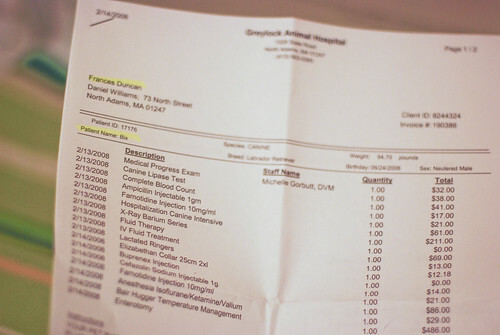 Need Help With The Vet’s Bill? A lot of people need help with the vet’s bill. A lot of people are put off from going to a vet because of the bill. Insurance is one answer but I don’t think it is necessarily THE answer. The winner is the insurance company. Elisa Black-Taylor gave me the idea for this post. She directed me to a Facebook page where a kind person has prepared a list of organisations that support people who need help with the vet’s bill. I would like to (a) spread the word and (c) over time contribute with donations from PoC. The American Animal Hospital Association (AAHA) has a “benevolent arm" that helps fund AAHA-accredited veterinary practices who have identified a need for assistance. The vet makes the application. The grant guidelines are on this page (link broken now – sorry). There are two main categories (a) financial hardship and (b) good Samaritan. USA based – This is a charitable organisation that supports people in financial difficulty with respect to health care of their companion animal. Link to home page. USA based – This is a charity who once again helps people who need help with the vet’s bill. They are reliant on donations themselves and as at July 2010 are unable to distribute funding due to a lack of donations to their organisation as a result of the economy in the USA. Link to home page. USA based – This is a Christian organisation that promotes animal welfare generally and which has a Veterinarian Charity Fund. They do support people who need help with the vet’s bill but pay out relatively small sums, which are no doubt welcome nonetheless. Link to Veterinarian Charity Fund page. USA, Illinois based – This organisation does exactly what people want who can’t pay the vet’s bill. They help. They focus on helping certain categories of people who are the most in need it seems (a) physically and mentally challenged individuals (b) Senior citizens (c) Children of the working poor. Link to Home Page. USA (NJ) based – Their objective is to try and save companion animals who are to be euthanised through want of caretaker funding. Home Page. USA based – This is right on the button for people who need help with the vet’s bill. There stated objective is to provide, “financial assistance to owners of domestic animals who need urgent veterinary care." They also provide lots of useful information on subjects such as “preventative care”. Link to Home Page. USA based – They have various projects one of which is called LifeLine Individual. This program is dedicated to helping people who need help with the vet’s bill. The grants are concerned with, “the cost of emergency veterinary care they otherwise couldn’t afford.” Link to this page. UK based – Cumbria and Lancashire. Small organisation. They provide a useful list of links including an organisation called Pet Aid which is said to provide funding of vet’s bills to £100 under certain criteria I would guess. Link. See also Animal Welfare Grants – these organisations tackle other areas of animal welfare. Hope this helps spread the word. Thank you Michael, these are all handy links to have when people need help.